5th Toshiba SD-P91S | What Car? The nine-inch widescreen makes this player ideal for two-person use, although you will have to buy a second pair of headphones if you want to watch in private. Sound quality is excellent, but picture quality is only average, with fine details lacking clarity. The player is also noisy, whirring along and clunking between DVD chapters. Battery pack life is up to five hours. The player is extremely simple to use, with all the buttons intuitive and all the sockets easy to locate. There is a remote control, too. It is easy to switch between mains and car adaptor power cables, and the battery pack is reasonably simple to fit, although it does add considerable weight. Internet deals of around 30% off the asking price are available by shopping around, which makes this premium brand player extremely desireable. The player is well put together and reasonably compact. It is built with hard-wearing materials. The controls are all solidly built, but the noisy operation when playing a DVD points to a considerable lack of refinement. The battery pack is relatively slim, so it takes up only a little extra space, and is easy to fit. 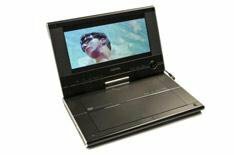 The P91S plays most DVD formats and DivX, jpeg and MP3 files, and can be plugged through a television and used as a standard player. You can also plug in a USB stick to show films and photos on it. The screen swivels 180 degrees, although we found this to be more of a gimmick than anything useful. One set of headphones comes as standard. The slimline remote control adds versatility. The AC and car adaptors come as standard, as does the battery pack. There's also a handy carrying case to put this lot in.